The whole idea of Totally Acoustic nights is in the name. It's Totally Acoustic - no PA system, no lights, no amplification, no electronic instruments, just completely powered by human beings. The idea to do this came from several gigs I'd done where playing totally acoustically was forced upon me, either by PA malfunctions, RUBBISH PAs, or just playing in strange places. 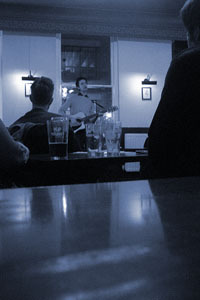 I always found these sort of gigs to be even more fun than usual - when there's nothing at all between yourself and the audience it feels a lot more intimate, like a friendly good-times singalong. I think the real mark of what a JOY these sort of gigs are is that every time I've done one people have ALWAYS stuck around afterwards until closing time, BOOZING and chatting and having a laugh. This, I feel, is a beautiful thing. Full details of how to get along to one of our nights are over on the venue page, but if you can't make it you can still listen in to the highlights via our series of podcasts. Pour yourself a beer while you do so!